From top, clockwise: My grandmother Fannie in the 1950s. My grandmother Fannie was 4 holding her hat. 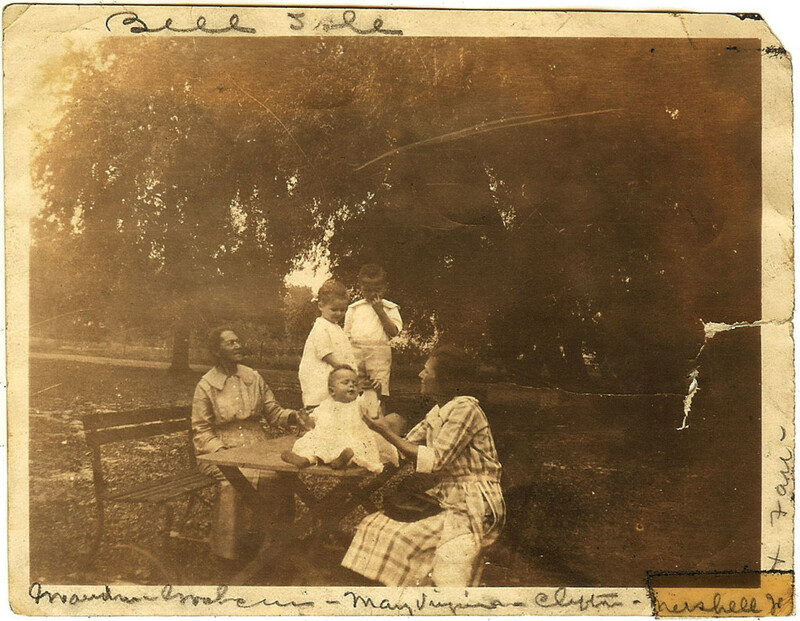 Her mother Jennie holding Daisy. Her father, Howard Turner had been killed. 1894. 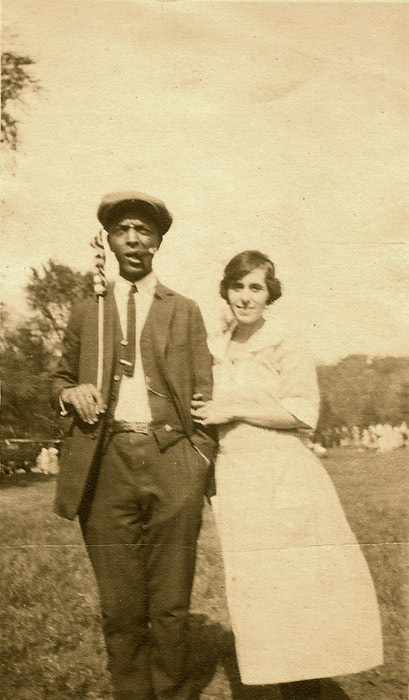 My grandfather Mershell pointing at Fannie about 1917. My grandmother holding my mother Doris up, 1923. 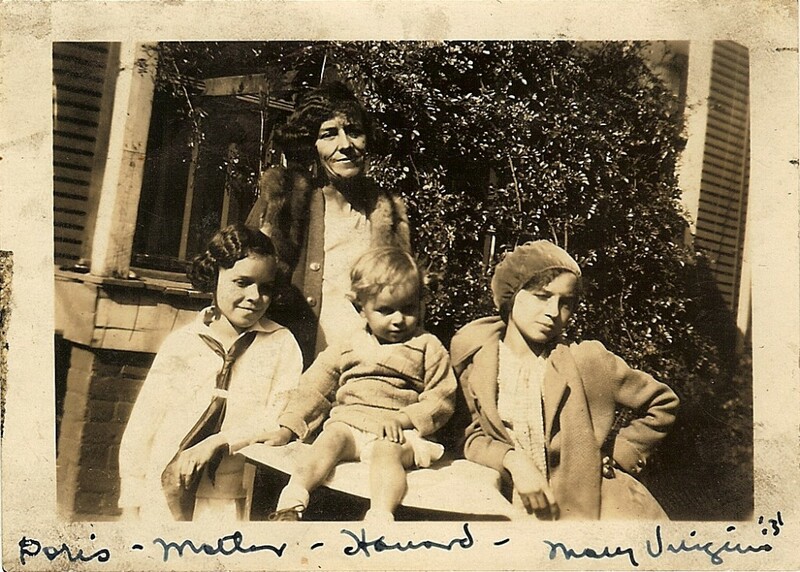 My grandmother in the back, her mother in the front holding baby Howard, on the left my mother Doris and on the right my aunt MV, 1930. My grandmother with her daughters MV and Doris, about 1934. My grandparents Mershell and Fannie (Turner) Graham, about 1945. 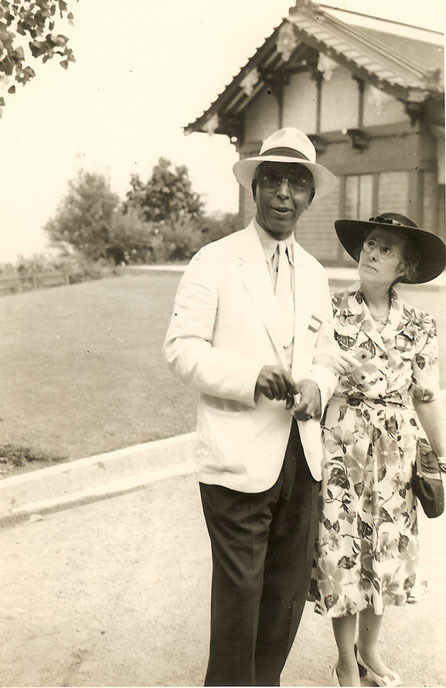 Fannie Mae Turner Graham 1888 – 1974. From Left to right My grandmother, Fannie Mae Turner Graham, peeking over my greatgrandmother’s, Jennie Virginia Allen Turner’s, shoulder. 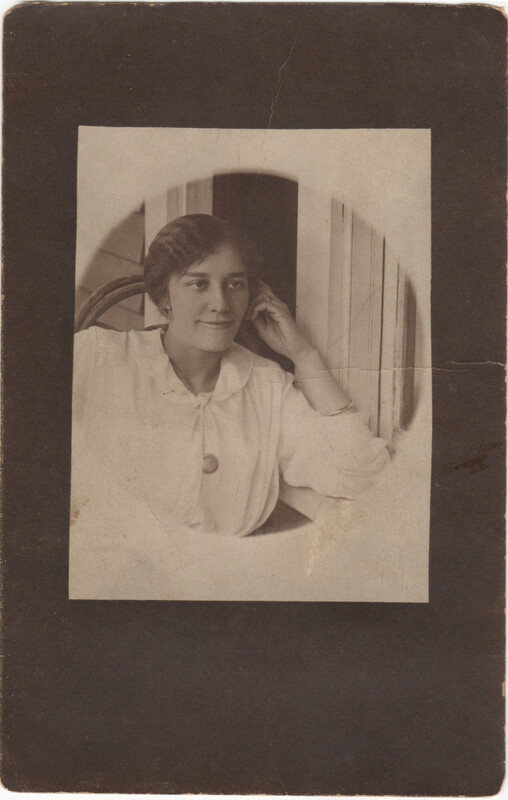 My grandmother’s sister Daisy Turner. Behind and between Aunt Daisy and Aunt Alice Turner, is my aunt Mary Virginia Graham Elkins, although she was not yet an Elkins. 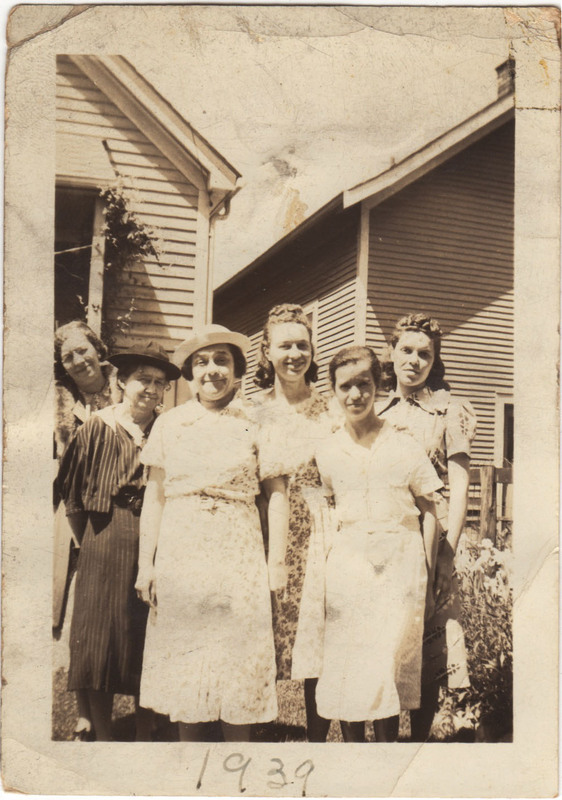 At the end, behind Alice, is my mother, Doris Graham Cleage, although she was not yet married a Cleage either. 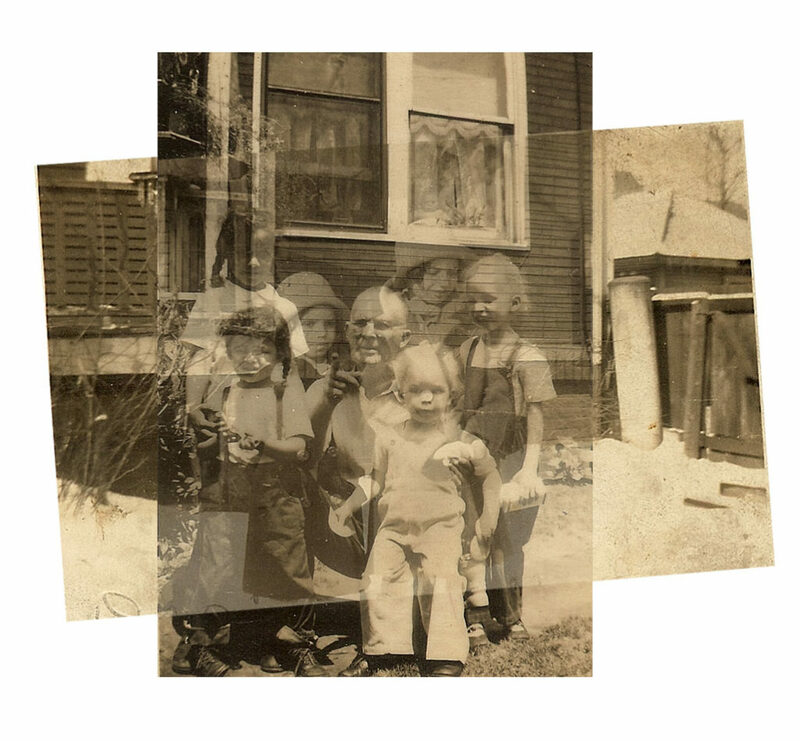 They are posed in Grandmother Turner’s backyard on the East Side of Detroit at 4536 Harding. The house is gone now. They look like they just came from Church, at Plymouth Congregational, however the photo is dated July 4, 1939 on the back. July 4 was on a Tuesday that year. Maybe they went on a church picnic. 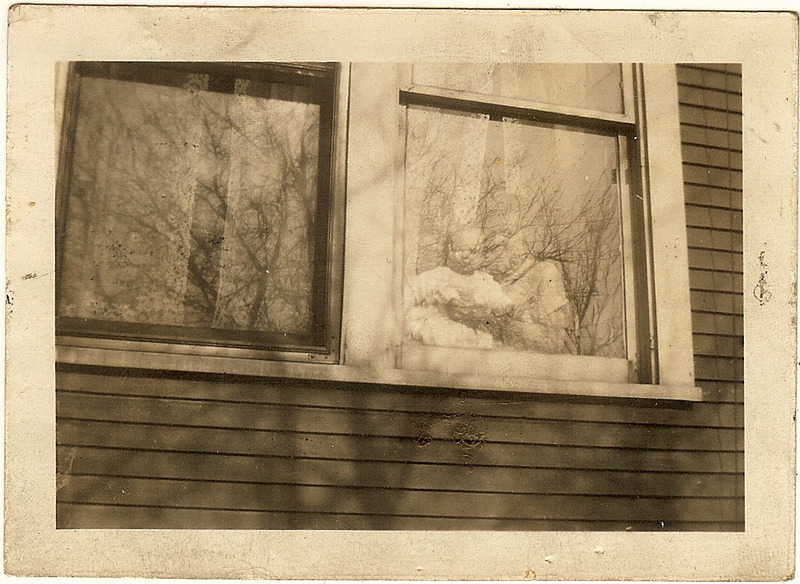 My grandfather, Mershell C. Graham took the picture. Only the skeleton remains. 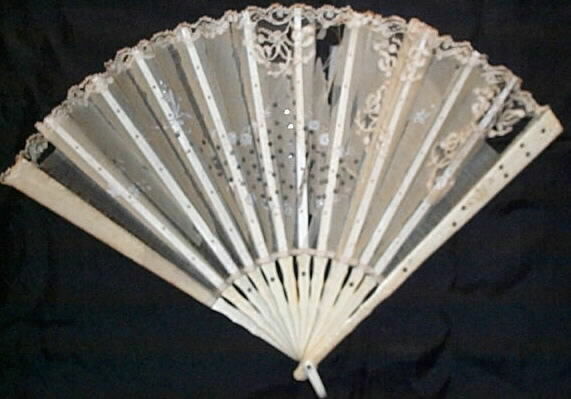 It used to be covered with gossamer thin white material with little sparkling threads, like the fan below. All rotted away now. 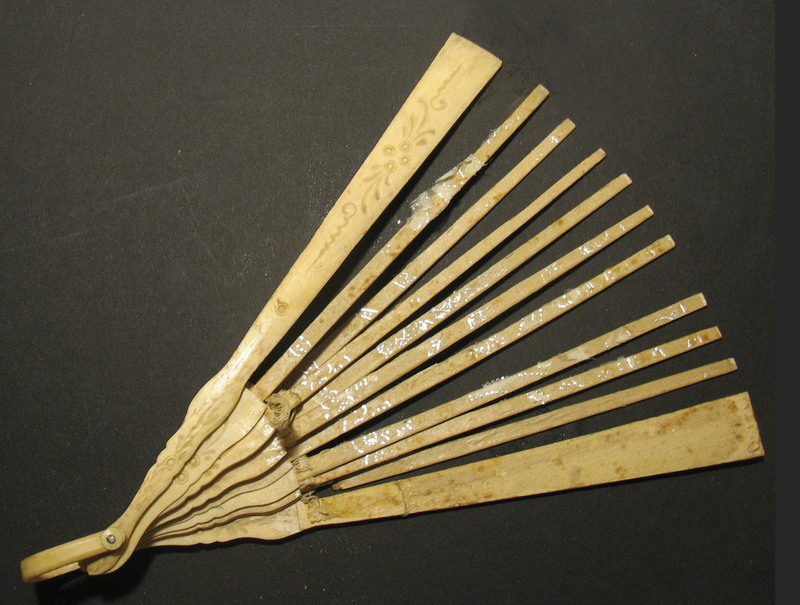 The fan once looked similar to this one. 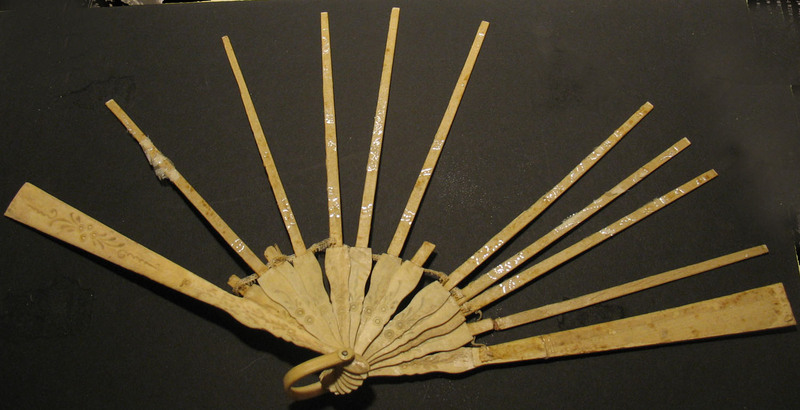 Click photo to see another fan. 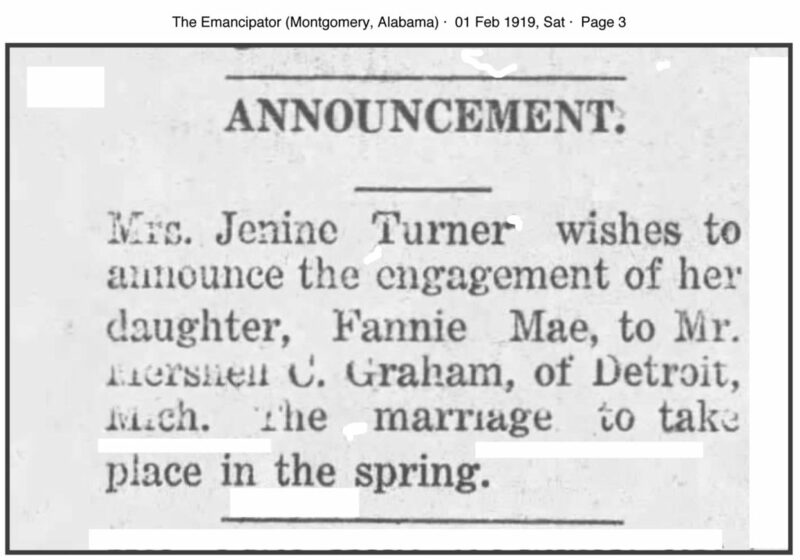 Fannie Turner before marriage – 1909. I wonder if she carried the fan when she was married. Fannie & Mershell after marriage in 1919. 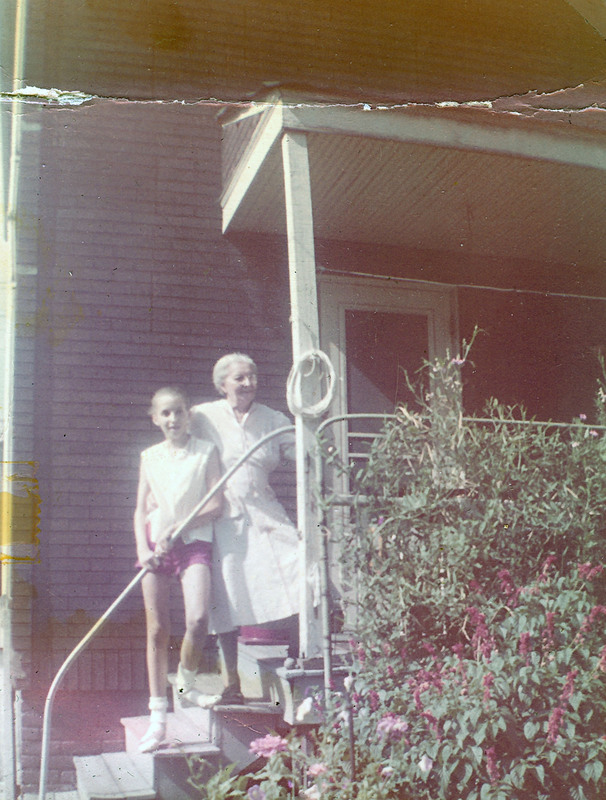 My maternal grandparent’s names were Mershell Cunningham Graham and Fannie Mae Turner Graham. They were both born in Alabama in 1888. Mershell was born in Coosada Station, Elmore County. Fannie was born in Hayneville, Lowndes County. Both counties are near Montgomery. Before moving to Detroit, Mershell worked on passenger trains in the dining car. 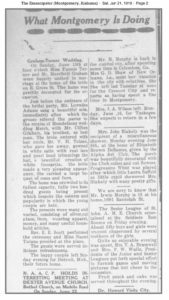 After coming to Detroit in 1917 he worked on a Great Lakes Cruise ship as a steward and finally put in 30 years at Ford Motor Company in the parts dept at the River Rouge Plant, before retiring. 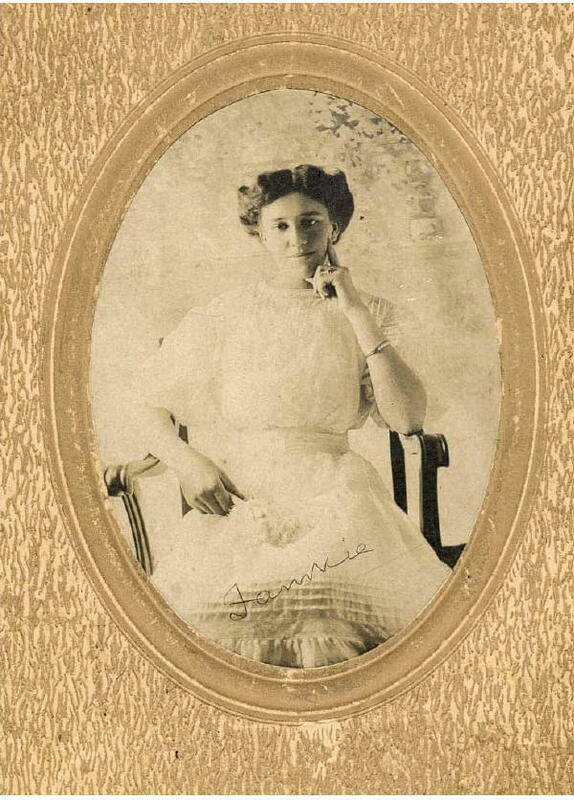 My grandmother Fannie, managed her uncle Victor Tulane’s store in Montgomery before her marriage. 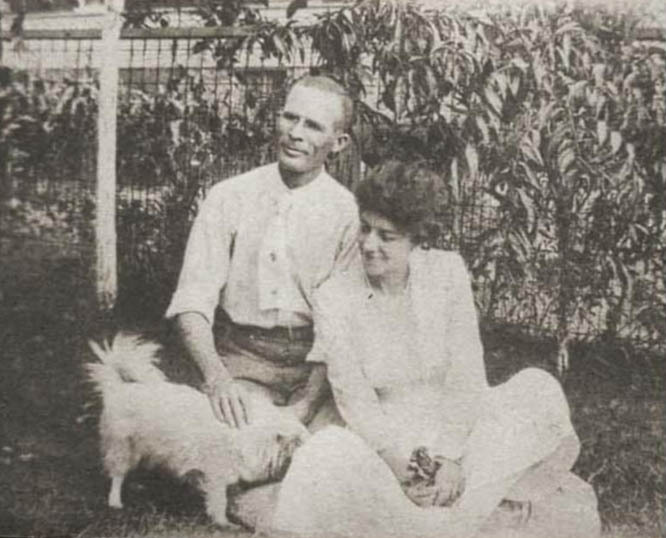 After their marriage in 1919, she didn’t work outside of the home. They both lived until I was in my mid-twenties. My grandfather died in 1976 at 86 years. I was 26. 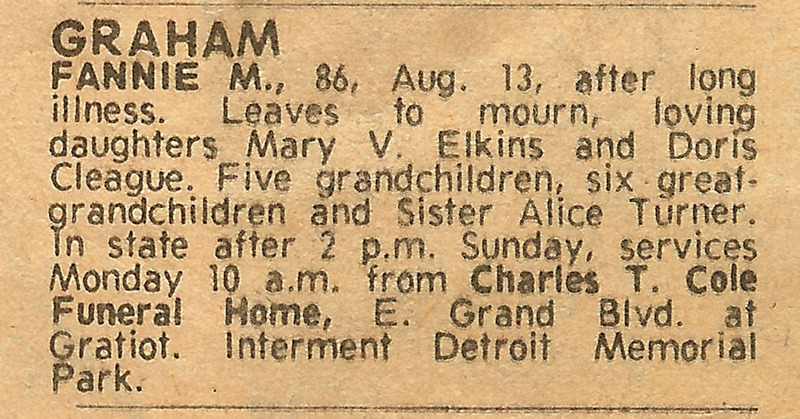 My grandmother died in 1977 at 87. They both died in Detroit. We spent every Saturday at their house when I was growing up and for the last year of college, they lived downstairs from us. They lived in that flat until they died. So I knew them and also research them. 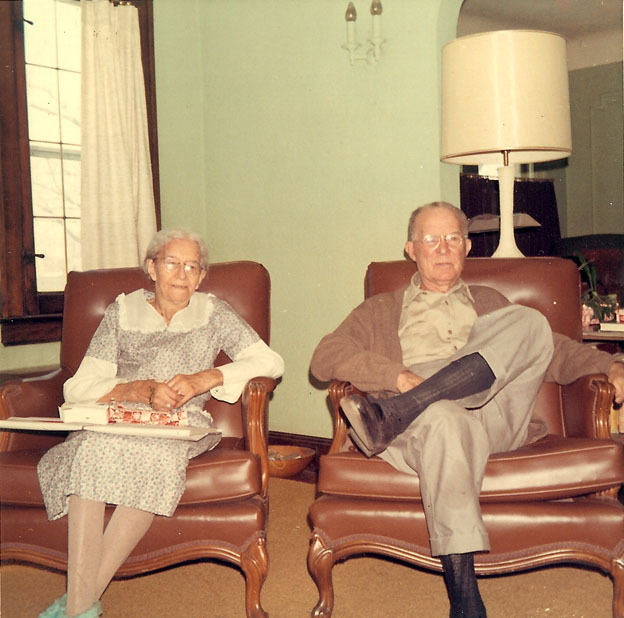 My paternal grandparents were Albert Buford Cleage and Pearl Doris Reed Cleage. Albert was born in Louden county, TN in 1883. Pearl was born in Lebanon, KY in 1886. 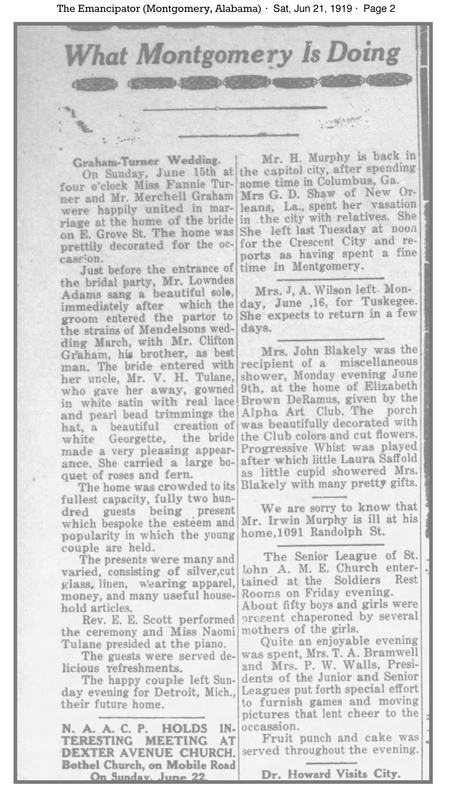 They were married in Indianapolis in 1910. My grandfather worked on a Great Lakes Cruise line summers until he finished Medical school and became a family physician. We lived down the street from them for several years when I was 5 and 6 years old. We saw them often. 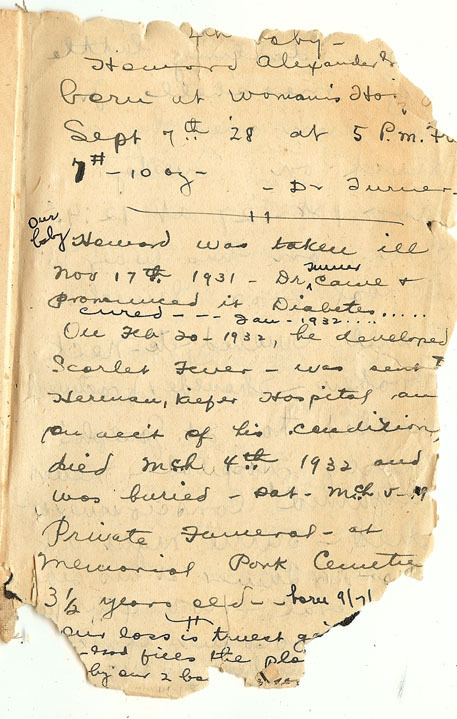 My grandfather died in 1957 after being ill for awhile. He was 73. 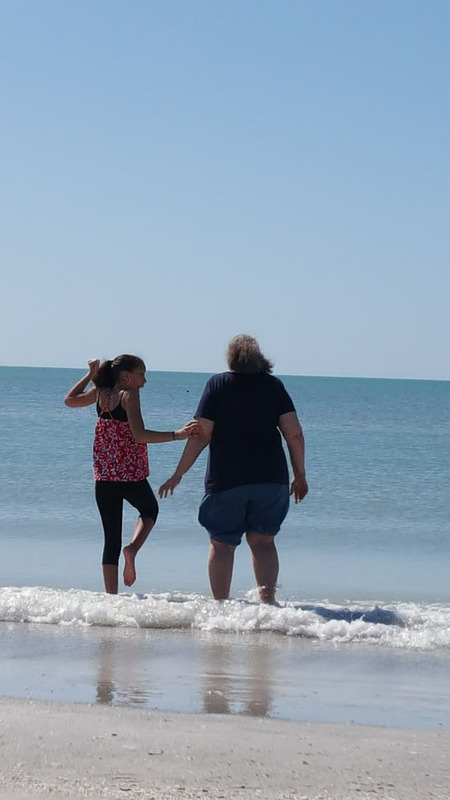 I was 11. My grandmother lived until 1982. She was 96. I was 35. I knew both of them. I also research them. 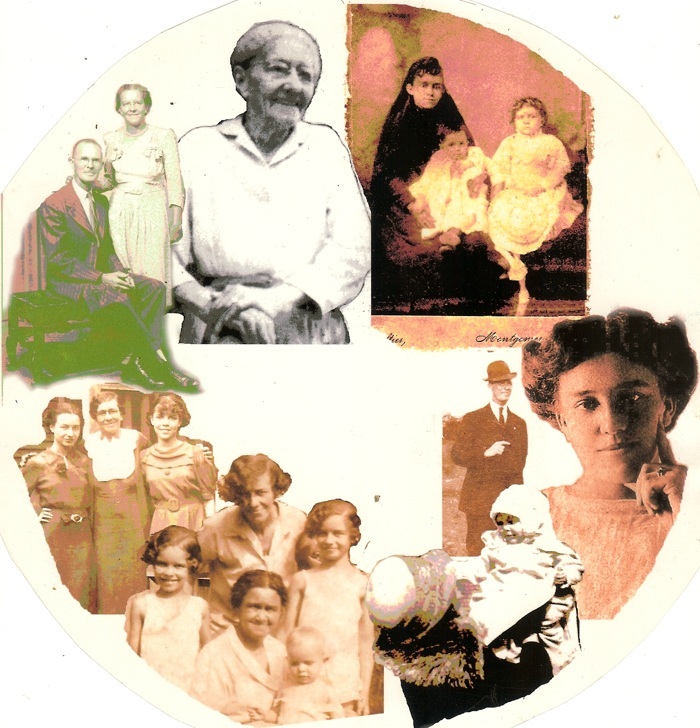 Below are links to some of the many posts about my grandparents on this blog. 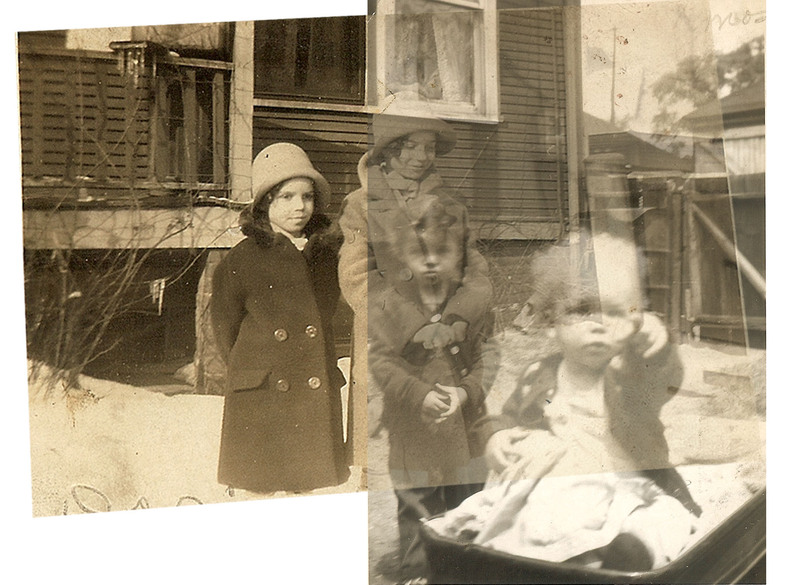 My grandmother Fannie with my mother Doris, Howard and Mary V. 1931 In their Detroit East side backyard. Howard Alexander Turner Graham. Born Sept 7, 1928 in Detroit. Between some pages my grandmother’s Bible are little snippets of hair. 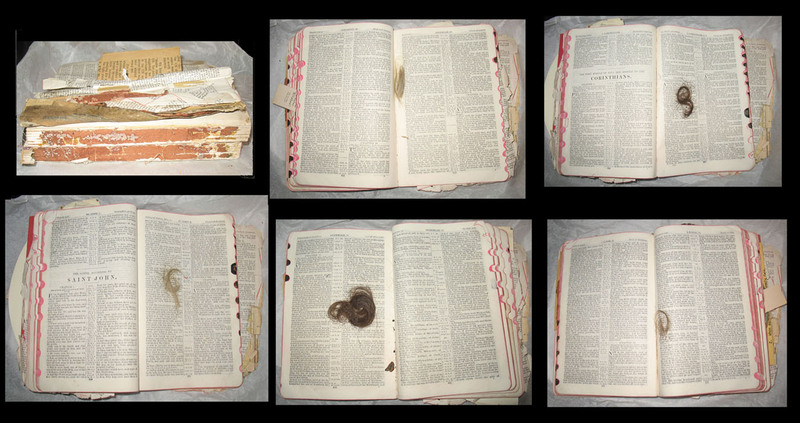 It is a well used Bible. The covers are missing. 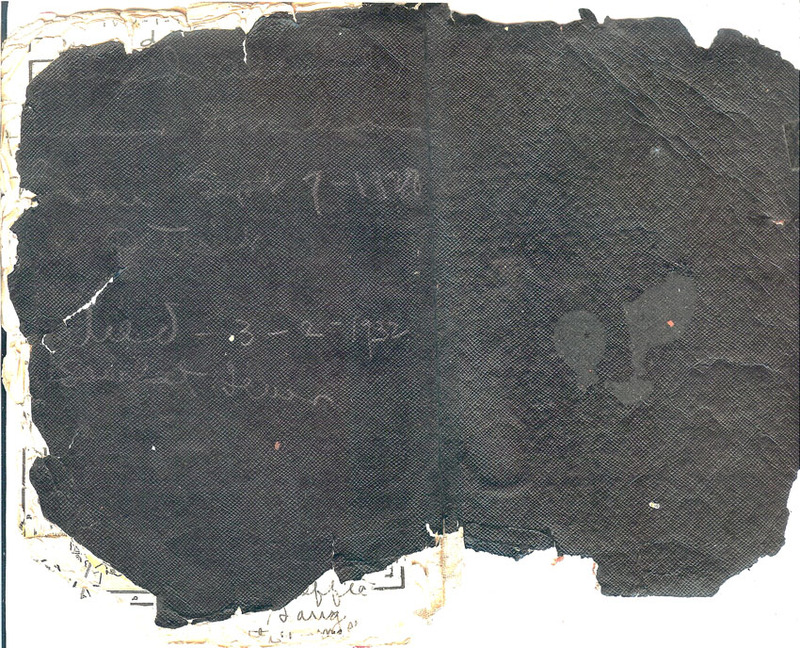 Part of the front cover remains, tucked between pages. 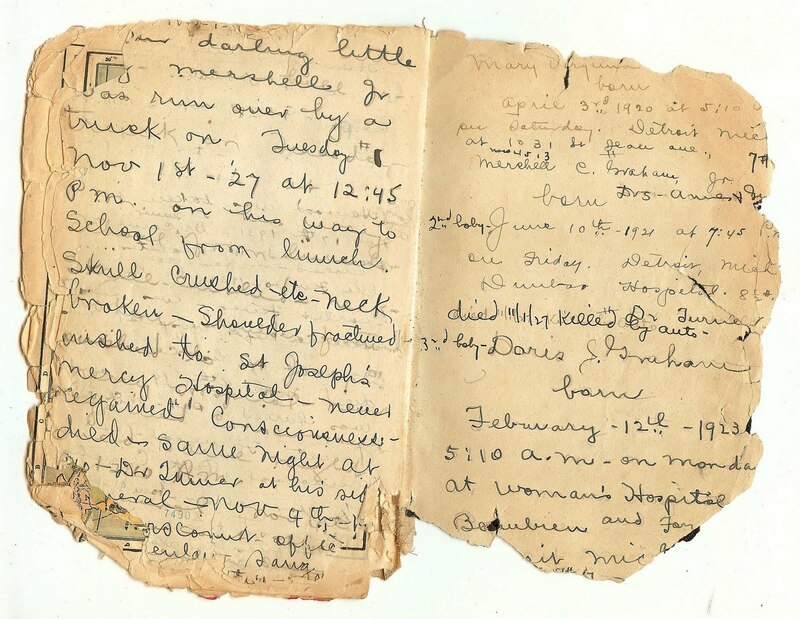 On this and on the back pages, corners worn away, she wrote about the births of her children and deaths of her two sons. I don’t know who the hair came from, but I would guess from her children. They were all blond as babies. Mershell and Doris with their father. 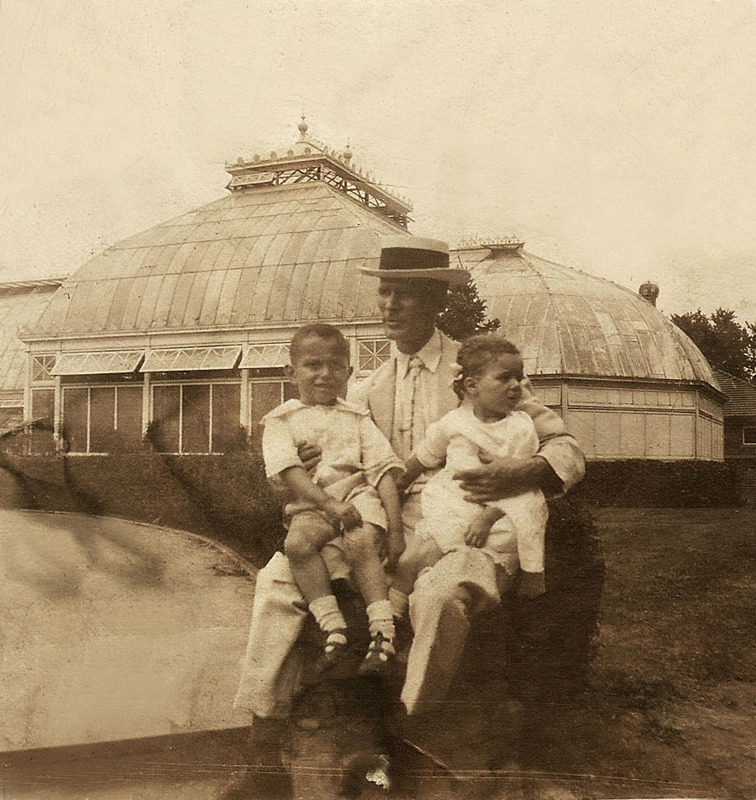 1925.Belle Isle, Detroit. 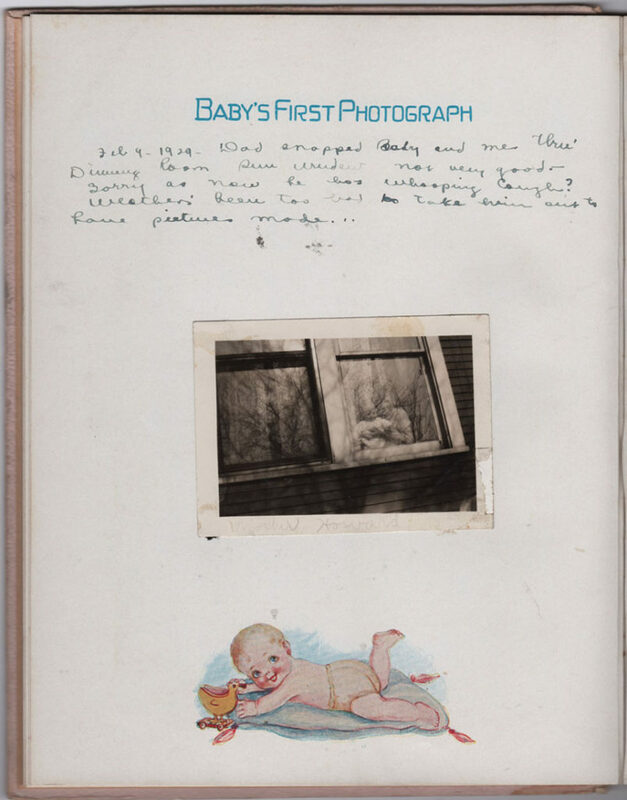 2nd baby – Mershell C. Graham, Jr. born June 10th – 1921 at 7:45 PM. On Friday. Detroit, Michigan. Dunbar Hospital. 8 1/2# Dr. Turner. Died 11/1/27 killed by auto. 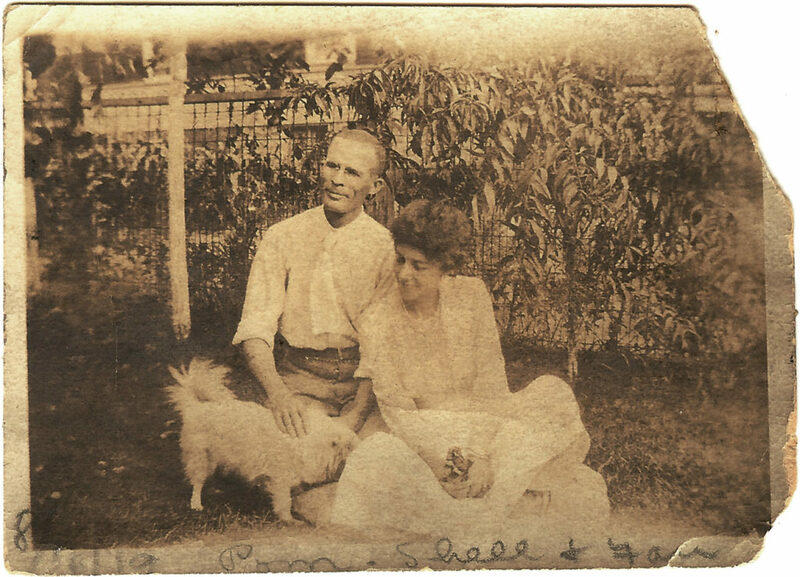 This photograph was taken about two years after the one of my grandmother Fannie at Sugar Island. Grandma Graham was my grandfather, Mershell Graham’s adopted mother. Mary Virginia was born in April 1920 so she would be 2. Clifton was the son of my grandfather’s adopted brother, Clifton. Mershell Jr was born in June of 1921 so he must be about 1 year old. 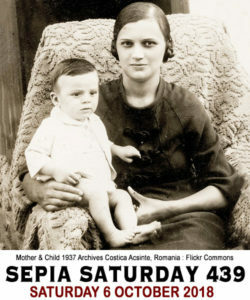 My mother was born in February, 1923 so my grandmother may have been just pregnant with her here. The park tables and benches are so unanchored. They are all cement now.